The Wild Neon Slot comes from Push Gaming and has five reels with three rows and 25 paylines. As the name implies, here you will find a futuristic-looking slot with neon-coloring symbols. Wild Neon is partly a fruit game and also has bonus feature, free spins and wild symbols. You can spin the reels of Wild Neon as low as 25p up to a maximum bet of £100. The Kaiju Slot from ELK Studios or the Spectra Online Slot from Thunderkick are similar slots. You can play the Wild Neon Slot on all platforms including Smart Phones. 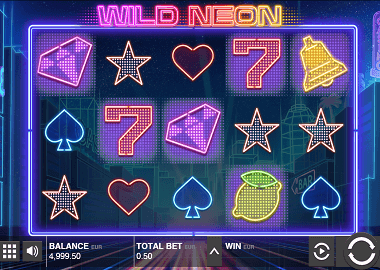 Symbols and payouts: The symbols on the Wild Neon Slot are all in neon colors. You play with fruits symbols and the playing cards symbols Hearts, Clubs, Spades, Stares and Diamonds. These symbols are also the low paying symbols with payouts up to 2x your bet. The higher symbols are a lemon, cherry, a bell, a red 7, a diamond and the yellow wild symbol. The latter symbol has the best payout of up to 10x your bet for a combination of 5 symbols. Linking Wilds feature: The Linking Wilds feature is one of two bonus rounds that you can play at the Wild Neon Slot. You trigger the feature by landing at least two wild symbols on your reels. The symbol next to the wild symbols is then converted into a wild symbol. If you can land even more wilds, you build very fast multiple pay-lines which are all filled with Wild symbols. Very good profits are possible in this way! Free Spins feature: Another bonus round is the Free Spins feature. You trigger this with 3 bonus scatter symbols and you have to land the symbols on reels 1, 3 and 5. You get 5 free spins and you can now activate some extras. These include additional free spins, 2x multipliers, instant cash prizes or 5 extra wild symbols which also land on your reels with each Free Spins. The Free Spins feature is the best bonus game on the Wild Neon Slot, and here you can land some very good wins with the extra features. Push Gaming is a small developer of online games. The company is based in United Kingdom and develops its games only in HTML5. Thus, all Push Gaming slots are playable on all devices including tablets, smart phones and desktop computer. Play the Wild Neon Slot here for free and without registration. Open the slot by clicking on the top banner in a new window. Well-known online casinos with Push Gaming slots are the Guts, Rizk and the Videoslots Casino. More Free Online Slots you find here in our Free Online Slots section.